Espresso catering for your event, party, or afternoon pick-me-up. Let Peddling Caffé Caterers help you create the perfect break for your special event. We cater all kinds of events throughout New England. Have Peddling Caffé add a unique espresso or nitro/cold brew coffee station to your special day. Impress your guests with the finest espresso and cold brewed coffee around! Need to impress your clients? Want to show your employees they are appreciated? Peddling Caffé can ride right into your office and serve our wonderful beverages to your clients and employees! Have a unique event that you would like to add a special touch to? Peddling Caffé can wheel right in to your convention booth, conference, movie set or private event. 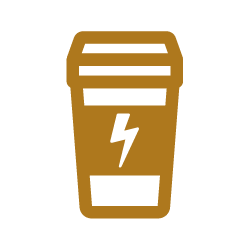 If a caffeine jolt is needed to liven up your event, we can do it! Our espresso is sourced from a regional Italian importer and our cold brew coffee is sourced from 11 different local roasters, including Barrington, George Howell, Jim's Organic, and more. Looking for coffee alternatives? Our Komboucha is made locally in Vermont, and we also supply six different cold brew tea flavors. With over ten years of professional experience in the coffee industry, we get coffee. We love it. And we love to serve it. Our trained baristas will cater your event with the care and respect you deserve. Corporate events, employee appreciations, trade shows, weddings, graduations. Our baristas and custom-built tricycles are geared up with everything needed to prepare delicious coffee shop favorites made to order for you and your guests. Add a specialty beverage or custom sleeve stamp to any package for an additional fee. In the future, we also hope to provide gelato service and other noshes as add-on items. Ask us how we can make your event extra special. © 2018 Peddling Caffé Caterers. All rights reserved. Design by Magnifico.